Bosch has expanded its Dicentis family with an interpreter desk that supports up to 100 interpreted languages. The design of the desk logically separates the incoming and outgoing languages in two vertically aligned columns via a high-contrast screen for quick comprehension and intuitive operation. 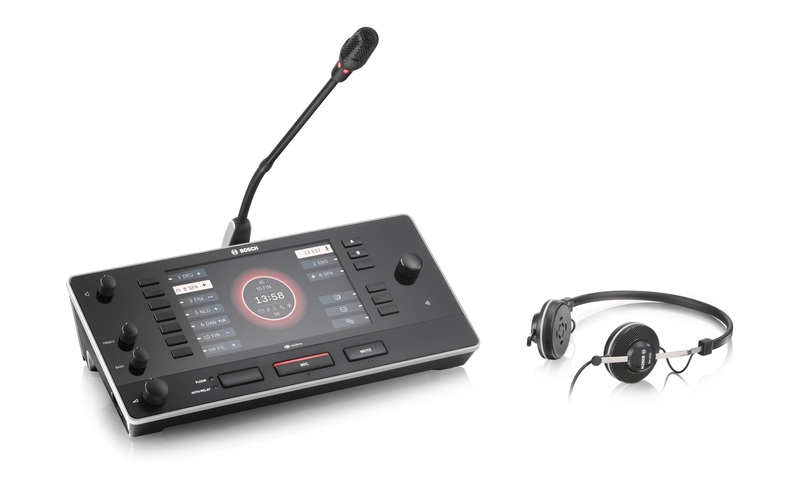 Three assignable buttons provide the interpreter with short-key functions for quick access to supporting functions such as “video select.” The HDMI output enables an external video screen to be added, so the interpreter can see the participant speaking or the participant’s presentation. Dicentis uses encryption standards for all audio and data. Audio and control is handled by Omneo IP technology, which also allows for system integration with third-party solutions. Omneo also enables the use of existing network infrastructure. The Dicentis interpreter desk is fully compatible with the Dicentis platform and complies with the simultaneous interpreting equipment standard ISO 20109. It enables the creation of passive overflow rooms adjacent to the main meeting room in case there are more participants than can be accommodated at the main meeting location. Using the Dicentis Meeting application, all languages and interpreter desks can be remotely configured and managed.